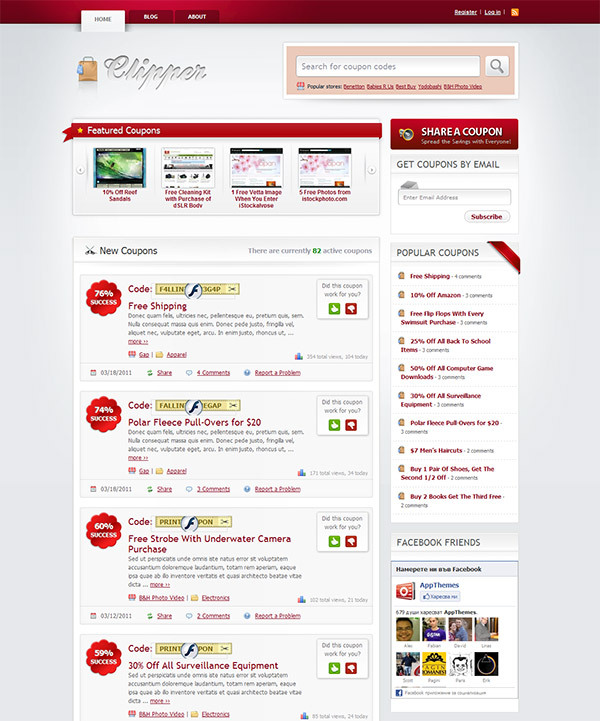 Clipper is a feature-rich coupon theme that was built for ease-of-use and tight integration with WordPress so you’ll be online and posting discount coupons within minutes using it, moreover you can easily build a community of users sharing promotions and discount codes using this theme. Coupons are kept totally separate from your blog posts. You get a dedicated coupon management section to see exactly what’s going on, making it easier to manage and keep track of your coupons. Editing coupons from the admin area is a breeze with the custom write panel. All custom fields and taxonomies are neatly organized and labeled in a single panel so you don’t have to search all over the place. You can also take total control of your customer communication by composing your own custom email templates. It’s easy to start listing coupons on your site, because the coupon form can require visitors to register first or keep it open for everyone to submit coupons. You can setup unlimited coupon stores and populate them with all the coupons you want. Each store is it’s own page which includes a description, url, and web site screenshot which is automatically generated. Your customers get their own personalized dashboard where they can view and manage their coupons. It also provides them with real-time stats so they see how popular their coupons are. Knowing which coupons and blog posts are the most popular is important. So there is a built-in stat system to keep track of how many daily and total views each coupon and blog post has received. And there is more, a lot more, making this premium application theme simply the best solution for quickly getting up and running a successful discount coupon sharing website.